In September 1942 during World War II the Army Air Forces was assigned its first women, members of the Women's Army Auxiliary Corps (WAAC), for work in the Aircraft and Warning Service which operated listening posts when enemy attacks on the United States were expected. The initial 6,000 women were so successful in this endeavor that the AAF asked for a half million, but the command prejudice was significant against female soldiers. In the summer of 1943, its auxiliary status was dropped, and the WAAC became the Women's Army Corps (WAC), placing the organization in the Army. When the AAF was permitted to do its own recruiting, the women were known informally as Air WACs. The peak Air WAC strength of over 32,000 was in 1945 when more than 200 specialties were filled by enlisted women, and officers occupied 60 specialties. About 1,100 black women served in segregated units, and more than 7,000 Air WACs served overseas in every theater of operations. Following the war, most Air WACs were discharged, and no WACs were transferred to the Air Force when it became a separate service in 1947. About 2,000 enlisted personnel and 177 officers continued to work in Air Force units although they remained in the Army. In June 1948, Congress established the Women in the Air Force (WAF), but limited the corps to 300 officers and 4,000 enlisted women. In June 1976, women were accepted into the service on much the same conditions as were men, and the separate status of the WAF was abolished. After several times rejecting proposals to use qualified women pilots for flying duties, AAF Commanding General Henry H Arnold agreed to the formation of two groups designed to assist in meeting the need for pilots to ferry aircraft. The Women's Auxiliary Ferrying Squadron (WAFS) and the Women's Flying Training Detachment were both activated in September 1942. Both were to use women employed as civilians in military tasks. The first organization was designed to use already qualified women aviators to ferry aircraft for the Air Corps Ferrying Command (later the Air Transport Service), and the second was to include an intensive training program to qualify women to replace men in a number of flying duties. 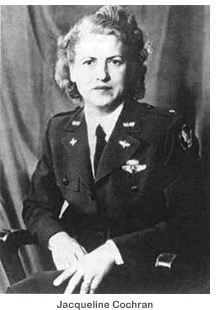 On August 5, 1943, the WAFS and the pilot trainees were merged into one organization, Womens Airforce Service Pilots (WASP), headed by Jacqueline Cochran. Training of women pilots preceded the merger, and by November 1942 trainees, who earlier were required to have a private pilotlicense and 200 hours of flight time, were accepted without prior flying experience. Most training, essentially corresponding to that given male aviation cadets, was conducted at Avenger Field, Sweetwater TX. The WASP pilot training program had 1,074 graduates who ferried aircraft, including bombers and fighters; towed targets for gunnery; and served as instrument instructors in the Eastern Flying Training Command. WASP director Cochran and General Arnold hoped to militarize and commission the WASP pilots, but by late 1944 the improving military situation and lower than expected attrition rates among male pilots reduced the need for female pilots, and the WASP organization was terminated on December 20, 1944, with the last graduating class at Sweetwater. WASP members remained civil service employees who did not receive the pay and benefits given to male pilots sharing the same risks. In recognition of this fact, on November 23, 1977, President Carter signed legislation providing procedures for former WASPs to be granted veteran status, although with limited benefits. Coincidentally, this was in the same year that the Air Force graduated its first female pilots. It was not until 1979 that the first WASPs were given discharge certificates; and it was 1984 before they were awarded World War II Victory Medals and those who had one year's service, American Theater Campaign Medals.